Aligning with NPE 2012’s theme of “The return of the machines”, Wittmann Group is presenting a wide range of injection molding machines and peripheral equipment at the show. A full range of PowerSeries is on display, including the MicroPower machine for high precision and micro injection molding, the all-electric EcoPower and the large machine model MacroPower. On a MicroPower 5/3, a 28-pin micro sub connector with a size of 6.1×1.2mm and a part weight of 3mg is produced from POM within a cycle time of 4s in a two-cavity mold supplied by Zumtobel. The parts are removed by a W8VS2 Wittmann robot and passed on to a camera integrated in the production cell and in the machine’s control system for quality inspection. The parts are subsequently separated according to cavities and stacked in a stacking module. In addition to the robot, a Wittmann material dryer, a temperature controller and a material loader are integrated in the machine and the Unilog B6 control system as well makes up a complete production cell. Two EcoPower machines are on display. First of all, a front panel for a coffeemaker is manufactured on an EcoPower 110/350 with integrated Wittmann equipment. It is a high-gloss visible part made of PC/ABS and produced by a variothermic process using Bfmold technology in a single-cavity mold supplied by Wittner. On the second exhibit, an EcoPower 110/130, a locking device for the foldaway tables on the back of airplane seats are manufactured from ABS in a two-cavity mold within a cycle time of 30s. As for the MacroPower, a folding box is manufactured from PP on a MacroPower 850 XL/8800, a wide platen version of the 850 tons with distance of 1,475×1,125mm between tie bars, in a mold supplied by Haidlmair. The parts are removed by a Wittmann W843 robot, then assembled at an assembly station, finally folded and stacked. Meanwhile, an in-mold labeling (IML) process is shown on a TM Xpress 160 in a hybrid version. Butter tubs with 125g capacity and 0.35mm wall thickness are produced from PP in a two-cavity mold. Insertion of the banderole label and removal of the finished parts are carried out by a Wittmann W827 robot, with a total cycle time of 2.8s. The production unit is also equipped with a mold space dehydrator from Eisbär. A special feature of this application is the new, modular IML line with a high performance drive package and an integrated CNC8 control system. 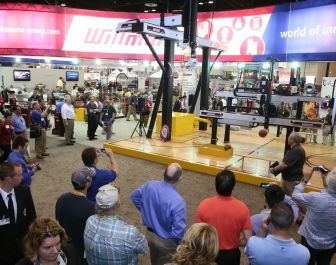 In addition, the Wittmann Group is presenting numerous peripheral equipment as stand-alone solutions, including its R8.2 servo robot series, Drymax dryers series, Feedmax loaders, Tempro plus temperature controllers, etc.